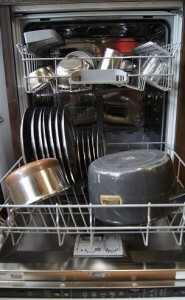 In layman terms, a dishwasher is a machine that cleans soiled dishes and utensils. It washes, rinses, dries and even sterilizes the dishes. Indian cooking methods use odd-shaped utensils, masalas and oils. Appliance manufacturers claim that your kadhai, idli makers, dosa tava, steel thalis will come out sparkling clean and free from masala and oil residue. Our guide will provide you with all the insights that help you understand and evaluate the best available dishwasher options in the market to make the right choice for your home without wasting your precious time, energy and money. The user needs to load utensils, add detergent, set the washing cycle and turn it ON. Once switched ON, the machine accomplishes a series of function by itself. It draws water, heats it to the appropriate temperature (55-75 deg C), sprays the water through jets onto the dishes and rinses it. It then releases detergent and dishes are cleaned with soapy hot water and then rinsed. Heating element at the bottom of tub finally heats the air to dry off the dishes. Own/rented house- If you rent your home you need a portable dishwasher. Type of Utensils- Typical to Indian market, an adjustable rack. There are many types of dishwashers available in the market to suit different lifestyles. Durability, size and convenience are the primary factors that give one the edge over the other. The capacity, special features and aesthetics affect the price of it. Built-in Under-Counter Dishwashers: It is a permanently installed dishwasher that fits directly under the kitchen counter and provides the best operating convenience. Since it is not connected to the faucet, the sink remains free for other purpose while the machine is running. The standard units measure 24” wide and come with all prices ranges and variety of features and options. Portable Free-Standing Dishwashers:Portable dishwashers are a wonderful option for people who relocate often since it does not require plumbing installation. It just requires a parking space in the kitchen. You have to wheel it near the kitchen sink and connect the “hook-up” to the faucet. Operation is simple. When not in use it can be parked and used as a countertop work space in the kitchen. Dishdrawers: The dishdrawer is a small dishwasher, typically the size of a large kitchen drawer which requires permanent installation. It comes in single or double-drawer models. In double-drawer, both drawers work independent of each other. Countertop Dishwasher: It is similar to the portable dishwater except that it needs a counter near the sink to be mounted upon. The temporary “hook-up” is connected to the faucet and its ready to use. Capacity: You can choose the capacity depending on the family size in terms of the number and type of utensils. An Indian kitchen uses more of steel and odd-shaped utensils like kadhai and Pressure cooker. People who eat in big steel thalis will require more space than the standard size. Dishwashers currently can wash a maximum of 116 utensils. The capacity of a dishwasher is measured in terms of “place settings”. Dishwashers are available in 8, 12, and tall tub configuration which is a 16 place setting. Tall tub units provide capacity to hold more items. A standard dishwasher with 12 place settings will typically hold 12 quantity each of dinner plates, quarter plates, dessert plates, bowls, cups and saucer, glasses, Knives, forks, soup spoons, dessert spoons and teaspoons, 3- 4 Serving plates and serving spoons. For a mixed-load, it can accommodate pots, pans, steel plates, kadhai, cooker and 30 to 40 standard size spoons and forks. Wash programs- Varied wash cycles economy, light and heavy: Advanced dishwashers provide custom settings for everything from fragile dishes and stemware to pots and pans. Tub Material: Stainless steel provides lasting and durable performance. It resists stains and odours. It transfers heat better for faster drying and can withstand high temperatures for sanitizing rinses. It is energy efficient compared to its plastic counterpart and save you money in the long run. Features: There are a wide range of features available to chose from. Each add-on feature comes with extra cost. The following are few features which will help you to narrow your search as per your need. Flexibility: Removable racks, collapsible racks, and adjustable shelves allow you to accommodate odd shaped and oversized dishes, pots and pan like kadhai, pressure cookers etc. Also look for fold-down tines, cup shelves, stemware holders and silverware baskets. Convertible racks are best option for multi use. Wash Cycles: Today’s dishwashers come with a plethora of cleaning options. 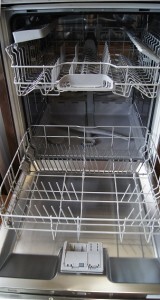 Dishwasher cycles allow for a customized wash depending on the type of dishes loaded. Delayed Wash- This allows you to program your dishwashers to start later beginning from one hour up to 24 hours ahead depending on the model. Rinse and hold. Rinses away food to remove bacteria and odour without using detergent while waiting for the full load. Rinse only. For clearing the leftovers. Quick wash. This is for lightly-soiled dishes in less time. Sanitize. A sanitize rinse uses extremely high temp and kills 99.9% of bacteria. Smart features: Most dishwashers today are equipped with sensors with smart technology for quality cleaning and energy savings. Soil level sensors senses the dirt and adjust wash cycles. Water sensors adjusts the water level and pressure accordingly to ensure sparkling clean dishes. Detergent sensors release the right quantity of detergent into the wash cycle. 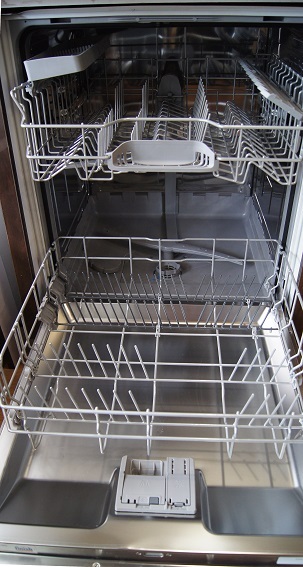 Washing levels: The performance of dishwasher is influenced by the number of washing levels, where and how the jets are distributed during the washing cycles. A 3-tier system will enhance the quality of the wash by ensuring better and even coverage. Auto-Restart: An important feature if there ae frequent power cuts in you locality.The dishwashers timer remember the point in the cycle where the machine stopped. When power resumes, the cycle starts from where it had stopped. Food disposals and filters: This is certainly a prime feature if you hate to scrape, pre-wash or rinse your dishes before loading them into the dishwasher. You can put your dirty dishes straight to the dishwasher without the fear of machine getting jammed or clogged. Self cleaning filters ensure hands-off maintenance while others have filters that must be removed and cleaned manually. Hard-water compatibility: Most places in India has hard water problem. Hard water causes scaling and reduces the action of the detergent, thus wasting soap and water. Machines with hard water compatibility have softening chambers. Rinse-Aid Dispenser: Rinse-aid dispenser holds a solutions that eliminated the water stains.. Insulation: Many dishwashers are insulated better than others by engineering quieter motors in order to run more quitely. Hidden controls: controls are hidden at the top of the door creating a smooth surface which is sleek and easy-to-clean. Finish and Style: A wide array of finishes, color and material is available to match your kitchen décor and taste. With Maids becoming more unpredictable and expensive, dishwasher is a wonderful option for the Indian kitchen. Much like the dishwasher that allows you to leave the thankless messy task of washing utensils to a machine, Conzumr.com consolidates all pertinent information regarding the best dishwashers in the Indian market allowing you to research these appliances with confidence and enjoy well deserved “My Time”!